I have worked for Kermans for 10 years in the residential department. When I first began, I placed orders with our vendors and have worked my way up into being a builder sales representative. I really enjoy it when one of my homeowners wants something out of the ordinary, and we get to work together and be creative with the look they really want. I especially enjoy tile and stone work in bathrooms and kitchen backsplashes. With tile and stone you can let your imagination lead your creativity. I spend most of my free time with my friends and family. I have a full house living with my fiancé Ray, step-son Dylan, step-daughter Sierra and our four dogs. We live two houses down from my mom and dad so we get tons of family time. Amber is an important part of the Kermans Advantage – unparalleled service and knowledge backs up every sale. 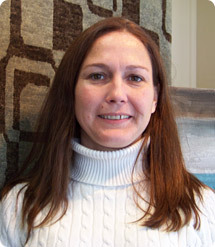 Whether you are carpeting a mansion in Carmel or looking for an area rug for your first home in Fishers, you’ll experience the same attention, care and exceptional result. Learn more about Kermans.